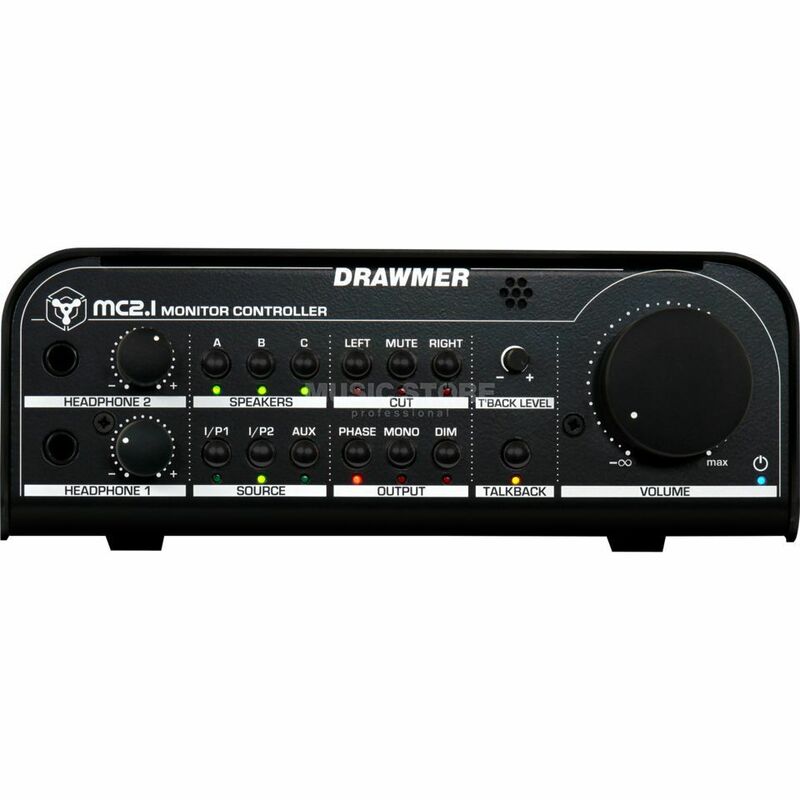 The Drawmer MC2.1 is a professional high quality monitor controller. It is imperative that what you record is exactly what you hear - this is the philosophy that is at the heart of the design of the MC2.1. With the Drawmer MC2.1 Monitor Controller incorporated into your system you combine the clarity, fidelity and transparency of the highest quality monitoring circuit with the complexity of a host of mix checking features. It is versatile and intuitive, but above everything else, where the Drawmer MC2.1 excels is in its accuracy and ability to faithfully reproduce what has been recorded. The MC2.1 incorporates four inputs with three stereo balanced speaker outputs, plus a dedicated mono speaker/sub-woofer output each with individual left/right trims under the unit to provide complete control over level matching. The active circuit has been designed to faithfully produce the audio signal whilst removing many of the problems that a passive circuit will bring. In addition, it has a host of mix checking features not often found on other controllers, such as individual left/right cut, as well as two seperate headphone amplifiers and a talkback facility, making the MC2.1 a true engineers tool. Whether you’re mastering a cd/dvd, recording, checking a mix for balance and e.q, doing A/B comparisons, plus a mutlitude of other tasks, you’ll have spent weeks designing the perfect studio environment and a fortune on active speakers, dynamics processors, various microphone and preamplifier combinations as well as a whole room full other gear, one thing is for sure - a monitor controller is central to every recording setup and probably the most important element of the entire signal chain - providing the ‘reference’ listening signal that enables the user to achieve the optimal mic placements, the perfect balance and EQ etc. There is one thing that should always be absolutely guaranteed - that you can rely on the accuracy of your monitor controller. 3 stereo balanced speaker outputs, plus a dedicated mono speaker/sub-woofer output. All have individual left & right trims under the unit to provide complete control over level matching. Comprehensive mix checking facilities including Left/Right Cut, Phase Reverse, Mono, Dim, Mute. Four inputs including balanced Neutrik XLR, balanced Neutrik XLR/JACK COMBI, and shared aux phono or 3.5mm jack. Two headphone amplifiers with individual level controls. Built in talk back microphone with level control, mono output jack and internal headphone routing.